At Vista Dental Care, we pride ourselves on partnering with patients to develop treatment plans they feel 100% confident in. In order to ensure patients feel comfortable with their treatment, we make ourselves available to answer questions and take the time to thoroughly explain every step of the treatment process. Before you begin a complex procedure like implant tooth replacement with our team, we encourage you to take the time you need to get answers to all of your questions. On this page, you’ll find answers to some of those questions we hear most often. This is not a comprehensive list, so please feel free to call our team to get more information or schedule an appointment in our Sparks dental office. Dental implants are small posts that look similar to screws prior to placement. Once in place, implants fuse with the supportive bone and gum tissue, mimicking the function of tooth roots. We can use strategically positioned implants to support any number of replacement teeth. What Materials are Used to Craft Implant Posts? Implant posts are crafted from a number of different materials. Some of the most common are titanium and zirconia. 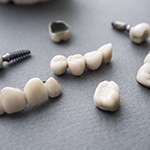 Before beginning your implant tooth replacement plan, we’ll take the time to review your options and help you choose the best one for your unique needs. The number of implants we use depends on how many missing teeth you have. A single implant post can be used to support a dental crown to restore one tooth. A fixed bridge can replace two or more consecutive teeth, and we typically anchor them to two implants, one at each end. Partial dentures are crafted to fill numerous gaps in smiles, and they can be supported by two to four dental implants. 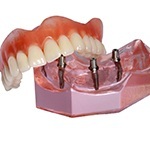 Full dentures are typically anchored with four to six implant posts. Dental implant posts are surgically positioned into the jawbone. A small incision is made into the soft tissue to the supportive bone structure beneath. Then, an implant post is placed into the jaw. Over the course of three to six months, the implants fuse with the supportive bone and soft tissue. Once the implant post is fused with the jawbone, you’ll return to our office, so we can attach your replacement teeth. How Long do Implant Tooth Replacements Last? On average, implant supported replacement teeth last twenty years. With proper care, patients may be able to keep their implant restoration for life. This is compared to traditional replacement teeth that need to be replaced or repaired every five to ten years. Do I Need to Care for My Implants Differently? For the most part, you can brush and floss your implant supported restoration as usual. To clean between more advanced tooth replacement prosthetics like partial and full dentures, we may recommend the use of an air or water flosser to remove plaque buildup between the gums and denture base. 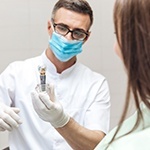 During your six month dental exams and professional teeth cleanings, we’ll be happy to provide guidance to help you maximize your at-home hygiene routines and keep your implant supported tooth replacement flawless and functional for longer.